After our five hour drive down from Queensland we booked into a motel, just on the outskirts of town. It was a 70′s mediterranean style, rendered concrete with arches, all painted fresh white with a small balcony overlooking the car park. The pool in the corner of the garden was covered in blue plastic which made it look cold enough to have an iceberg floating in it. As we were checking in, a surfer from the unit next door was checking out. Seems he hadn’t been to Crescent for quite a while either, said it was always too crowded with longboard riders, sometimes up to twelve in the water at one time. He couldn’t believe his luck or lack of it when he realized the Crescent Head Longboard Contest with it’s 450 longboard competitors was in town. Talk about stepping into the fire. Vans and tents filled all available campsites as we drove past the country club and in to check the waves. Either side of the parking lot along the point was filled with surf vehicles of all shapes and values. Longboards protruded out from converted campers and more were laid orderly along the wooden railing beside the grass, some collectors pieces with high price tags. The winter sun was sparkling across the bay and swell poured in around the tip of Crescent Headland. The waves ran mechanically following the curved rock line then swept all the way past the creek mouth and down the beach. Absolutely spectacular. Nothing had really changed, it was reminiscent of nearly every other time I had been here, the last probably thirty years ago. The point was just the same as I remember it, long lines exploding on the back of the headland, some swells running wide and missing the point proper. The middle sized waves being the ones to catch. They just got bigger as they went down the line. The contest was an extravaganza. 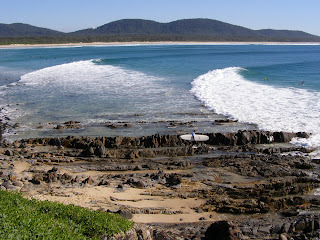 Kids, mums, daughters, over 65′s and everyone in between, they were all here and most were surfing in a division. We found a spot to park not too far from the point and went for a wander along the grass that borders the rocks. A colourful array of longboards lined the grass and salty sunbleached faces hide behind dark sunnies and straw hats. Every now and then someone would call out my name and then after seeing my face with a blank expression when I looked at them, would introduce themselves. People change a lot in 40 years, mainly hair loss, but after a few minutes of chatting the memories slowly forge out of the fog and the stories and re-collections start flowing. Friendships re kindled. For most the re-connection to the glory days of our youth was what this weekend was all. Some of the younger hotter longboard riders surfed beautifully on traditionally shaped boards. They loved the style and the spirit that came from the golden era of surfing. You have heard it all before, were the wind was always offshore and the waves was always up. Everyone had a story of great waves and surfing as well as some trips or mischief we shared. Most had been coloured slightly to enhance the details, and some that were re-countered I couldn’t remember for the life of me. Ah, the cobwebs of the mind. Crescent Heads, I once wrote in the seventies, was a sleepy little village, often only a whistle stop on the drive between Sydney and Queensland. Once Monday comes back around it will return to it again, much to the relief of the locals. Although I’m sure surfers like Kenno and a few of the others that have moved there in recent years to enjoy the peace and quiet of Crescent appreciate the company even if only for the weekend.